"He's just lazy and temperamental," sighed Francie. "He just doesn't want to go forward no matter how much I tap him with the whip or dig my spurs into his sides. And he's so ornery!" And no wonder. Her saddle was sitting squarely on the horse's shoulders. Every time her poor horse tried to take a step, the firm panel of the expensive dressage saddle dug into his shoulders and prevented them from moving freely. "Get off the horse a second," I said. After Francie jumped off, I loosened the girth and pulled the saddle back, making sure there were two finger widths between his shoulder and the panel of her dressage saddle. Her horse literally sighed with relief. "OK, hop back on," I told her. And to her amazement, her horse was no longer unwilling to go forward. ​Incorrect saddle placement is one of the most frequent problems I encountered as a riding instructor. This was equally true for beginners, intermediate, and advanced riders. 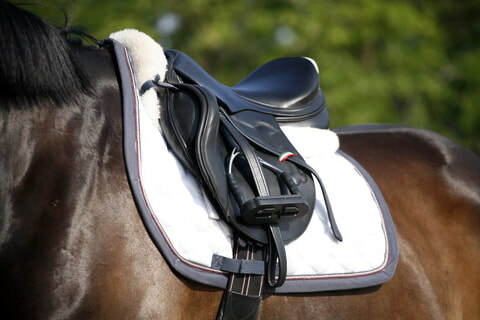 It was true of hunter/jumpers as well as dressage riders—even though jumping saddles have soft, flexible panels that are designed to sit forward. Here is a picture of a dressage saddle that is properly placed, and one that is placed too far forward. ​​Notice that the saddle in the left photo is well back of the shoulder, allowing full movement. In contrast, the saddle in the left photo is too close to the shoulder, impeding its movement. Here is a picture of a jumping saddle that is properly placed (left) and one that is placed too far forward (right). ​The important thing to notice is that a saddle set too far forward will interfere with the shoulder blades, shortening the steps of the forelegs. The front edge of the saddle will bump against the cartilage cap of the shoulder blade during every stride. Over time, this can injure the horse's latissimus dorsi muscles, which are responsible for pulling the horse forward when a fore leg is grounded. That is why it is absolutely crucial that you know where your horse's shoulders are located and how they move as he moves. Stand next to your horse and run your hand down from the wither, over and around her shoulder. Feel its size, pressing lightly to get a sense of how the muscles, bone, and tendons are arranged. Then walk along side your horse and place your hand on the top of the shoulder blade. You will feel the joint move as your horse moves. Her shoulder must be that free under saddle. ​​Keep in mind that shoulder conformation can be slightly different for each individual horse, and different breeds on average have different shoulder conformation. For example, Morgans and Arabians tend to have sloping shoulders that give them their flashy movement, while Thoroughbreds have more upright shoulders that are designed for speed. Placed a saddle pad on your horse's back with the front edge slightly in front of the wither. Then place your saddle on top. Pull the pad and the saddle back down over the wither until the saddle bars rest 2-3 finger widths behind the shoulder. Pull the pad up inside the gullet so that it doesn't press down on the wither. Then attach and tighten the girth. This is easy to do with a dressage saddle because the panels extend straight down, and are firm. It's a little trickier with jumping saddles because the flexible panels sit forward of the actual points of the tree. Make sure the points of the tree are 2-3 finger widths behind the shoulder. Don't push the saddle further back than 2-3 finger widths because a saddle set too far back will irritate the horse's back and will place the rider's weight behind the most stable arch of the ribs.